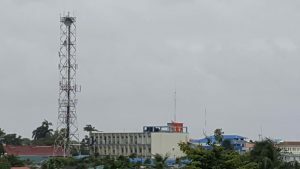 The Guyana Telephone and Telegraph Company (GTT), whose headquarters are located near the old Guyana Gold Board (GGB) location, says an undisclosed number of its employees have been tested with high levels of mercury, a problem that the Ministry of Public Health has since been called in to address. In correspondence seen by Demerara Waves Online News, Natural Resources Minister Raphael Trotman told GTT on August 18, 2018 that the Ministry of Public Health and the Pan American Health Organisation were now responsible for all mercury matters and that a meeting would be organised by the Health Ministry’s Permanent Secretary. It is unclear how long mercury levels could remain high in someone’s body, but a source close to the GGB said “we stopped burning gold since April of this year” at the Upper Brickdam, Georgetown location. Numerous Guyana Geology and Mines Commission workers, who shared the same compound with the GGB, earlier this year registered very high mercury levels as a result of a problem with the GGB’s facility where raw gold taken by miners to be sold was being burnt. The Gold Board has since removed its operations to Queenstown, Georgetown where a brand new internationally standardised burning facility has been installed. The telecoms company confirmed that it has lodged a report with the Ministry of Natural Resources, Ministry of Public Health and the Ministry of Social Protection’s Department of Labour after one employee last month recorded a high level of mercury, prompting tests by other workers. “Early August we received a medical report from an employee which indicated levels of mercury in his system. GTT commissioned a random sample testing of members of staff after receiving this report and there were mixed results,” the phone company said. Neither the company’s spokeswoman, Jasmin Harris nor its Chief Executive Officer, Justin Nedd could say how many workers’ have been tested positive with high levels of the poison. Sources said the company has told government that two workers have been sickened by mercury and were receiving treatment. President of the Guyana Postal and Telecommunications Workers Union, Harold Shepherd told Demerara Waves Online News that GTT’s Director of Employee Experience, Martin Cheong informed him that tests revealed that “some” were found with high mercury levels. Shepherd recalled that one worker tested positive after heeding the union’s advice at a members’ meeting that they should be tested. He said union representatives and company officials would meet early next week to discuss the issue and obtain figures about the number of affected workers. GTT said, through its company’s medical plan, it continued to provide assistance to employees. “The health of our team is of paramount importance and we will continue to keep them updated as new information becomes available,” GTT added. GTT’s complaint came one day after government held a national stakeholders meeting to discuss mercury and its impacts in addition to a symposium and a public lecture. Recently, government blocked the importation of 30,000 kilogrammes of mercury from Mexico to be used in the mining industry.